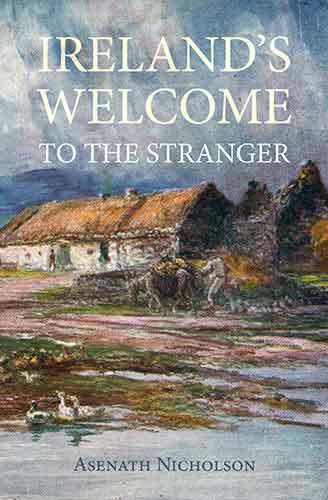 Extracts from William Bennett's Account of his Journey in Ireland. North Arran, 24th of Third-month, 1847. Nothing could be more favourable than the next morning for the proposed visit to the island of Arranmore. Not deeming it right to go empty-handed among the hungry multitude, we provided ourselves with fifty-six tickets, for a stone of meal each, for distribution. The distance from Burton port is about four miles, not open sea, but interspersed with rocks and islands. As our visit was wholly unexpected, we landed about midway on the eastern shore without much observation. The presence of a stranger, however, soon attracts attention, and especially one so well known as the medical superintendent; and no sooner did the work of visiting the cabins commence, than the crowds collected soon became so dense, that ingress and egress were difficult, and sometimes force had to be used. It was a warm sunny day, and we walked leisurely over the whole of the more thickly inhabited portion of the island, which lies principally towards the main land. The agent of the Irish Island Society was absent; and they had not yet their soup-kitchen in operation. In another part of the island was a soup-kitchen established by the "Appeal Committee," (a committee formed of the gentlemen who signed the address before alluded to), but under the worst management; which, as Dr. Brady, who was himself one of the committee, witnessed it with the greatest pain, was doubtless remedied by this visit. The great difficulty of control and management at such a distance, where there is not a single resident to be depended upon, and where those on the mainland have their hands and hearts so full and overburdened, is a serious obstacle. We spent the principal part of the day upon the island, in a walk of about six miles through most of the villages; and, in spite of their repulsive features, entered the cabins as long as our tickets lasted, endeavouring to search out such as lay more in the interior, or had not claimed much notice before, or were the most destitute. There was indeed but little to choose, where misery and want were in all so palpable. Throughout the island there was a remarkable equality,--one mass of deep-sunk poverty, disease, and degradation. The details I need not attempt; it has been done before most vividly. The dwellings, upon the whole, were perhaps, externally, a shade better than the mere turf-hovels of Erris. I fear to state the number of families in which sea-weed and limpets appeared to be the only substitutes for food; although the ravages of famine and pestilence were still short of the harrowing scenes we had witnessed in the Mullet. There were the same gaunt looks in the men, and the peculiar worn-out expression of premature old age in the countenances of the women and children; but the latter still clutched, with an eagerness I shall never forget, at some biscuit I had brought with me, when offered them to eat with their sea-weed; very different from the apathy and vacant stare, yet more heart-piercing, with which the unaccustomed sight was regarded by those in whom the very desire and volition were past. We thought there were exhibited marks of a longer period of neglect and degradation; as if these poor islanders had never known any other state, and expected nothing better. Their importunity was also not without rudeness and abuse, when the tickets were exhausted, and there was nothing more to be had. The bits of paper, in the way of petitions ready prepared, constantly thrusting into our hands, evinced an older trade in beggary. We detected, too, instances of exaggeration; and, under any other circumstances, some amusing ones of pretence. My son who was more at liberty to observe, discovered that girls and children were up and running about as soon as we were fairly cleared off, who had on our approach thrown themselves on their miserable sleeping places, and beneath what covering they had, as if sick. The feature that struck me most forcibly was, that among this whole population, estimated at 1,500, there was not a single particle of work of any description that we could see going forward, either inside the cottages or outside upon the soil, except one old woman knitting. It may now be naturally inquired,--what is the result? Has any good been accomplished?--can any good be accomplished for Ireland? Is there any improvement? Have we a more cheering prospect for the future? or is there any possibility of a change for the better? Are there any remedies that can be applied to prevent the recurrence of the same evils? The simple travelling of an Englishman in Ireland, at the present juncture, with his mind and heart open--the interchange of information and experience,--the mere expenditure of the money,--I believe to be a great good. The result of our individual seed-sowing has yet to be shown. We have reason to believe upwards of 2,000 poor cottiers have been more or less set to work on their own plots, with the stimulus of obtaining, by their own labour, some future supply of food for their families, where they would not otherwise have had any; thus introducing new ideas, as well as the necessity of better habits of agriculture. Female industry has been upheld and promoted in several places, by the funds placed at our disposal by the Ladies' Committee of London; and flax sowing to some extent has been encouraged in two fresh quarters. The sight of a stranger in some of these remote localities is like that of a friend; and I do trust we have been made instrumental in holding up the hands of individuals here and there, who were devoting their exertions in some of the distressed districts, in endeavouring to alleviate the misery around them; but were ready to faint, and all but borne down by the weight and extent of the calamity. We have felt it a great privilege to be thus employed, at whatever sacrifice. I expect a full report will be received from every locality in which the seeds have been scattered. In these Letters I have endeavoured to give a bird's-eye view, as it were, of the distressed portions of Ireland, drawn upon the spot, with the vivid delineations of truth, but without exaggeration or colouring, and as concisely as possible; accompanied by such details as might serve to illustrate the actual condition of things, to indicate the causes that have operated, and the elements that are still at work, or exist to be worked upon, in her domestic and social constitution. Any of these might have been expanded into a volume. What is the picture? Take the line of the main course of the Shannon, continued north to Lough Swilly, and south to Cork. It divides the island into two great portions, east and west. In the eastern there are distress and poverty enough, as part of the same body suffering from the same causes; but there is much to redeem. In the west it exhibits a people, not in the centre of Africa, the steppes of Asia, the backwoods of America,--not some newly-discovered tribes of South Australia, or among the Polynesian Islands,--not Hottentots, Bushmen, or Esquimaux,--neither Mahomedans nor Pagans,--but some millions of our own Christian nation at home, living in a state and condition low and degraded to a degree unheard of before in any civilized community; driven periodically to the borders of starvation; and now reduced by a national calamity to an exigency which all the efforts of benevolence can only mitigate, not control; and under which thousands are not merely pining away in misery and wretchedness, but are dying like cattle off the face of the earth, from want and its kindred horrors! Is this to be regarded in the light of a Divine dispensation and punishment? Before we can safely arrive at such a conclusion, we must be satisfied that human agency and legislation, individual oppressions, and social relationships, have had no hand in it.